It seems like a great idea. 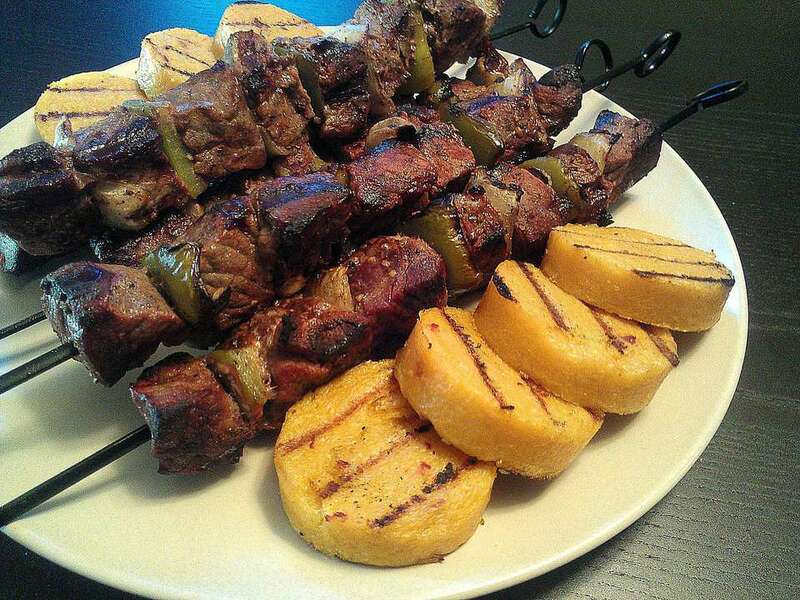 You thread cubes of beef with cut up vegetables onto skewers, marinate and grill. The only problem is that the beef is overcooked and the vegetables are undercooked, or visa versa. Why? The greatest challenge to grilling kebabs is that different things cook need to cook for different times. How do you solve this little problem? One way is to precook vegetables, especially squash or similar things. The problem with that is the vegetables get soft before you put them on the skewers so they won't hold on as well. Plus you end up defeating the simplicity of kebabs. You want to be able to cook everything once and not spend a lot of time in the kitchen preparing the ingredients. Well, there is an answer. First of all select non-meat items for the skewers that don't have to be cooked completely to be palatable. Onions, peppers, carrots and other foods that don't have to be cooked through to be good are perfect for kebabs. In fact, I find that having the vegetable part of the kebabs on the crunchier side adds to the quality of the meal. You should also consider fruits as a good addition. Pineapple is especially good because it adds a sweet/tart flavor to the kebab. The second thing to do to get the vegetables cooked right along with the meat is to use small pieces. Ideally, your chunks of meat should be about 1-inch square. Keep the fruit and vegetables to about this size. The best way to cut up the onion is to peel and cut into eighths, remove the core and possibly trim to size. For peppers, cut them in half, remove stem and seeds and then cut down into 1-inch squares. Try to do everything this size. Once you have your vegetables selected and everything properly cut up you will need a marinade. You can marinate the meat separately and then brush some of the marinade over the whole kebabs before you grill, or you can simply place the whole kebabs in the marinade and let them sit for an hour or two. Because of the small size of all the pieces, it doesn't take very long for the marinade to sink into the meat. Also, by marinating everything together you spread the flavors of the vegetables to the meat. As for the grilling time, all you really need to worry about is the meat. Since we have eliminated the need to get the vegetables cooked completely, watch the meat. When it reaches the desired doneness, remove and serve. Cook over a high heat, covered for about 8 to 10 minutes. Because the steak is only an inch square it will cook fast so keep a close eye on it. As for the kind of skewers, it really doesn't matter. Bamboo skewers are cheap, but they can burn and catch fire. A burning skewer is not what they mean by flaming kebabs. Use sheets of aluminum foil to shield the exposed parts of the bamboo skewer from the fire. Metal skewers work great but they get really hot. On threading everything on I find it best to not start or end with things like onions or peppers because they tend to dry and shrink on the grill and that can make them slide, especially on metal skewers. I usually end with a piece of meat because it holds on to the skewer a little better.